Friday 9 April 2004, by BAVADAM*Lyla, CHATTOPADHYAY*Suhrid Sankar , DAS*Prafulla, GOPALAKRISHNAN*Amulya, KAUR*Naundhini, KRISHNAKUMAR*R. , MENON*Parvathi, NAGESH KUMAR*S., NARRAIN*Siddharth, RAJALAKSHMI*T.K., RAMAKRISHNAN*Venkitesh , SUBRAMANIAN*T.S. , SWAMI*Praveen , TRIPATHI*Purnima S.
The battle lines are almost clear and the major formations have hit the campaign trail. But there are worrisome ground realities still to be dealt with. Reports from the States. THE saffron scarf that Andhra Pradesh Chief Minister N. Chandrababu Naidu wore when he met Deputy Prime Minister L.K. Advani in Hyderabad during the latter’s Bharat Uday Yatra seemed to indicate how badly the Telugu Desam Party (TDP) chief now needs the support of the Bharatiya Janata Party. More significantly, the political clock has turned full circle. Chandrababu Naidu, who was once part of the anti-BJP secular front, waxed eloquent about the feel-good factor and attributed it to the progress achieved under the rule of the National Democratic Alliance (NDA). His praise of the BJP was understandable since it had done him a good turn by calling the elections to the Lok Sabha to coincide with the Assembly polls in Andhra Pradesh. 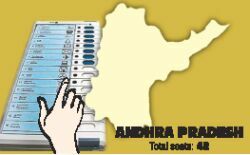 In the simultaneous elections held in 1999, the Congress(I) polled 40.6 per cent votes but its seats tally stopped at 91 whereas the combined vote share of the TDP (43.8 per cent) and the BJP (3.7 per cent) fetched them 191 of the 294 Assembly seats. The TDP-BJP alliance also walked away with a phenomenal 36 out of the 42 Lok Sabha seats, with the Congress(I) lagging behind with a paltry five seats although its vote share was 42.79 per cent against the TDP’s 39.85 per cent. Clearly, the 9.9 per cent share of the BJP helped turn the tables against the Congress(I). The issue of a separate Telangana is, without doubt, the one factor that will determine the electoral outcome, but the question uppermost on people’s minds is whether Chandrababu Naidu, now into his ninth year in office, will retain power. There is no gainsaying the fact that Elections 2004 will be a different ball game. For one, the TDP knows that if regional sentiment catapulted it to power in 1983, sub-regionalism, as espoused by the Telangana Rashtra Samithi (TRS), can cut into the TDP’s votes. K. Chandrasekhar Rao, TRS founder, belongs to the same political school from which Chandrababu Naidu graduated and where street-smart politicians and not hidebound ideologues are produced. Failing to find a berth in the State Cabinet, the TRS leader did the next best thing: he launched his own political party three years ago with the confidence that he could stoke the dying embers of the pro-statehood sentiment in Telangana, a region that has received more attention by way of promises than genuine development. The TDP has to reckon with the sharp polarisation of political parties and, along with the BJP, is bracing for a do-or-die battle against the Congress(I)-TRS-Left parties combine. It can ignore the significance of alliances only at its own peril. The Congress(I) has agreed to part with 42 Assembly and six Lok Sabha seats to the TRS. So munificent has been this gesture that the TRS was hard put to identify suitable candidates for all the seats. However, the upshot is that the TDP leaders are now a worried lot. And they have every reason to be so. In the 2001 panchayat elections, the combine of these parties had a significant edge over the TDP in Telangana. Their combined tally of zilla parishad territorial constituencies was 269, far higher than the 167 of the TDP-BJP alliance. The backlash that the TDP expected in the Andhra region against what it described as an "opportunistic" alliance did not materialise. On the other hand, Congress(I) leaders such as Daggubati Venkateswara Rao, son-in-law of N.T. Rama Rao, pushed the idea that a separate Andhra State would do the region a lot of good since the Vijayawada-Guntur area could have an international airport, a high-tech township and such other facilities it now lacked. Even if an undercurrent of discontent exists against the Congress(I)-TRS alliance in the Andhra region, the TDP will have to put in a lot of hard work to improve upon its 1999 performance when it won 99 out of the134 Assembly seats in the region. For one thing, the Telangana issue has pushed into the background the plank on which Chandrababu Naidu decided to go in for the elections - Naxalite violence - in the wake of the near-fatal attack on him at Tirupati on October 1 last. This, in spite of the fact that extremists of the People’s War (PW) have been killing TDP rank and file at will in tune with their threat to eliminate TDP and BJP functionaries if they did not resign from their posts. Since the Tirupati attack, Naxalites have killed 33 functionaries of the TDP, including M. Venkata Raju, husband of Tribal Welfare Minister M. Mani Kumari, on March 18 at Paderu in Visakhapatnam district, and four of the BJP. One of the campaign planks of the TDP is to expose the covert sympathy the Congress(I) and the TRS have for the Naxalites. Taking no chances about the possible threat of disruption of elections by the PW, the State police will be deploying military helicopters for combing operations, reconnaissance and airlifting electronic voting machines on polling day. 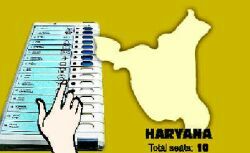 Over one lakh police personnel will be deployed on April 20 and 26, the two dates for polling in the State. Playing big brother in the State, the TDP has allotted 27 Assembly and nine Lok Sabha seats to the BJP after some hard bargaining between Chandrababu Naidu and BJP general secretary Pramod Mahajan. This has left the BJP’s rank and file disappointed since they expected the party to be allotted more seats in tune with the perceived improvement in its popularity. It was a measure of Chandrababu Naidu’s level of confidence that he dissolved the Assembly in November, a clear 10 months ahead of its date of expiry. Four months down the line, he cannot boast of the same degree of self-assurance because of various factors. One of them is the incumbency factor. He tries to wish this away through the management of the media and publicity blitzes every now and then. For instance, he has claimed that power sector reforms were his major achievement. But the very reforms seem to have undermined his popularity. The electorate will not forgive him for the massive increase in power tariff he ordered in 2000, a year after he won the Assembly elections. There are instances galore of electricity officials disconnecting supply to consumers who were unable to pay their dues. In one case, a lineman administered electric shock to a tribal woman at Venkatram Thanda in Singaram village of Mahabubabad for not paying electricity arrears incurred for running her agricultural pump-set. It is not surprising, therefore, that the Congress(I)-TRS alliance has a clear edge over the TDP in Telangana, which accounts for 107 Assembly seats. The high power tariffs and the absence of support prices for paddy, chillies and cotton have also turned the farmers against the ruling party in coastal Andhra, while in the Rayalaseema region, it is a mixed bag. Chandrababu Naidu roots for an integrated State, a stand that has earned him supporters among integrationists. He accuses the Congress(I)-TRS of trying to divide the State for narrow political gains. But this argument has not cut much ice with the electorate since his ally, the BJP, has been ambivalent on the Telangana issue. It adopted a resolution supporting a separate Telangana at Kakinada but shelved it because of political compulsions. Over the years, Chandrababu Naidu has acquired the image of being tech-savvy and reforms-oriented, but the April elections will see him in a different avatar - as a pro-farmer leader who is set to transform rural areas. The TDP manifesto has promised that Rs.1 lakh crores will be spent on the transformation of the rural economy. This image makeover is in keeping with the changing political equations. 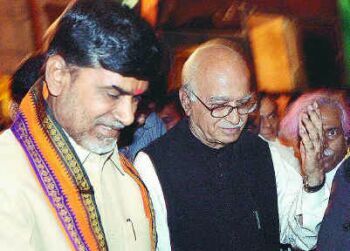 But will his closeness to the BJP see Chandrababu Naidu through in what is going to be a very close election? THE ruling All India Anna Dravida Munnetra Kazhagam has set its well-oiled propaganda machinery rolling in Tamil Nadu. The party’s money power became evident when its supporters systematically captured wall space all over the State in February itself and painted slogans asking people to vote for AIADMK candidates in the May 10 elections. Chief Minister and party supremo Jayalalithaa launched the party’s election campaign on March 9 from Chennai and has since covered several parts of the State. The AIADMK is contesting 33 of the 39 Lok Sabha seats, having allotted six seats to its only electoral ally, the Bharatiya Janata Party (BJP). The BJP is also contesting the lone seat in Pondicherry. Jayalalithaa shocked the cadre when she renominated only two (T.T.V. Dinakaran from Periakulam and S. Murugesan from Tenkasi) of the 10 sitting party MPs. Party seniors such as T.M. 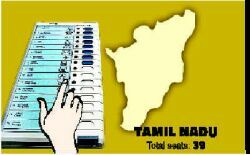 Selvaganapathy, Dindigul Srinivasan and K. Malaisamy (Ramanathapuram) have been denied the ticket. 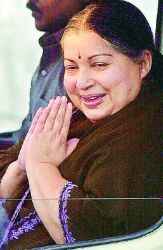 Jayalalithaa has chosen 31 new faces, who include nine district secretaries, sending jitters among the cadre about the party’s prospects. The mood in the Democratic Progressive Alliance (DPA), headed by the DMK, is one of quiet confidence. The DPA includes the Congress(I), the Marumalarchi Dravida Munnetra Kazhagam (MDMK), the Pattali Makkal Katchi (PMK), the Communist Party of India (Marxist), the Communist Party of India (CPI) and the Indian Union Muslim League (IUML). The DMK is contesting 15 seats, the Congress(I) 10, the PMK six, the MDMK four, the CPI(M) and the CPI two each, and the IUML one. Although both the DPA and the AIADMK began their campaign on March 9, the campaign has not shifted to top gear. Countering Jayalalithaa is the star DPA campaigner Vaiko, MDMK general secretary. The Jayalalithaa government had imprisoned Vaiko under the Prevention of Terrorism Act (POTA) for speaking in support of the banned Liberation Tigers of Tamil Eelam (LTTE). He was freed on February 7 after 19 months of incarceration in the Central Prison in Vellore. He drew huge crowds in Chennai, Tiruchi and Virudhunagar and other places in the State. Vaiko and former Minister M. Kannappan, who were elected to the Lok Sabha from Sivakasi and Tiruchengode respectively in 1999, have opted out of the contest this time. MDMK presidium chairman L. Ganesan is contesting from Tiruchi. M. Karunanidhi, the 81-year-old DMK president and the architect of the DPA, is brimming with confidence over the powerful line-up. The rumblings in the DPA over seat allocation have died down. Congressmen in Pondicherry and Nagercoil were angry with Karunanidhi over the allotment of these two constituencies, which had been traditionally held by the Congress(I), to the PMK and the CPI(M) respectively. With the Congress(I) high command announcing on March 8 that it had no plans to field a candidate from Pondicherry, the situation is easing there. The DMK list has no surprises. It has fielded Dayanidhi Maran, son of "Murasoli" Maran, the late Union Minister and Karunanidhi’s nephew, from Central Chennai. Murasoli Maran had held that seat. There is a third front in the fray, called Makkal Kootani (People’s Alliance). It comprises two Dalit parties, the Dalit Panthers of India (DPI) headed by the firebrand Thol. Tirumavalavan and, the Puthiya Tamizhagam, led by Dr. K. Krishnasamy and the Makkal Tamil Desam of S. Kannappan, among others. The People’s Alliance has fielded candidates in 25 constituencies. Tirumavalavan and Dr. Krishnasamy are angry that the DMK did not give them a berth in the DPA. These two parties may rob the DMK and the Congress(I) of their Dalit votes. The BJP did some clever poaching. Its candidate for the Dharmapuri seat is P.T. Elangovan, the incumbent PMK MP. His defection was kept a secret until the BJP announced his candidature. Elangovan, a PMK senior, was feeling stifled in the party after party chief Dr. S. Ramadoss preferred A.K. Murthy to him for a Union Cabinet berth. Besides, the latter was denied the ticket to contest from Dharmapuri. Another surprise ticket winner is D. Periyasamy, who had crossed over from the DPI to the BJP. M.N. Sukumar Nambiar of the BJP is facing the seasoned trade union leader, C. Kuppusamy of the DMK, in North Chennai. In Pondicherry, the BJP’s Lalitha Kumaramangalam, sister of late Rangarajan Kumaramangalam, will fight Dr. M. Ramadoss. In the southern districts there are clear indications of voters’ preference for the DPA and for Sonia Gandhi, the Congress(I) president. There is an undercurrent of disillusionment with the AIADMK government. NEARLY three weeks after the Opposition Left Democratic Front (LDF) announced its list of candidates to the 20 Lok Sabha seats in Kerala and went into campaign mode, the ruling United Democratic Front (UDF), especially its lead partner, the Congress(I), was fighting bitterly over the choice of its candidates and threatening to wreck the coalition’s chances in several of its strongholds. 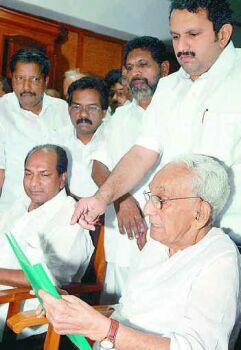 At the time of writing, the list of Congress(I) candidates drawn up after the election-eve rapprochement between Chief Minister A. K. Antony and octogenarian party leader K. Karunakaran ignoring the interests of several leaders and group loyalists had led to widespread resentment within the party unit. In the Ernakulam Lok Sabha byelections six months earlier, the Congress(I)’s official candidate and Antony loyalist M.O. John was defeated, thanks largely to Karunakaran’s rebellious actions. John, a natural aspirant for Ernakulam, could not find a place in the Antony-Karunakaran list. Instead the new formula suggested as the candidate Edward Edezhathu, a Karunakaran nominee, a college lecturer new to politics. Similarly, in Kasaragod, the claims of several prominent Congress(I) leaders were ignored and a Karnataka-based industrialist N.A. Muhammed was selected as the party candidate. Several close associates of Karunakaran came out openly against what they called the "son-daughter promotion venture" of Karunakaran and the wholehearted compromises Antony seemed to make in order to prevent the veteran leader from sabotaging the party’s chances in the elections. Key Karunakaran loyalists Rajmohan Unnithan and Saratchandra Prasad, among others, raised serious allegations of corruption against Muraleedharan in the selection of candidates and in the fund-raising that preceded the anti-Antony rally organised by Karunakran’s "I group" in Ernakulam some months earlier. Widespread resentment within the Congress(I) has therefore provided an edge to the LDF in the elections scheduled for May 10. The Communist Party of India (Marxist)-led LDF won nine of the 20 seats in the 1999 Lok Sabha elections, with the CPI(M) itself winning eight seats (Kasargod, Kannur, Vadakara, Palakkad, Ottappalam, Kottayam, Kollam and Chirayinkeezhu) and the Kerala Congress(Joseph) one (Idukki). The CPI(M) has now renominated all but two of its sitting MPs. In Kasaragod and Vadakara, the sitting MPs, T. Govindan and A.K. Premajam, have been replaced by P. Karunakaran and P. Sati Devi. The Opposition coalition is in a fairly good wicket in all the nine seats it won in 1999. In addition, the LDF candidates at Ernakulam, Kozhikode and Mukundapuram seemed to have the odds in their favour, as their Congress(I) rivals are likely to bear the brunt of the renewed factional war within the party. Moreover, in Mavelikkara and Alappuzha, considered Congress(I) strongholds and where party general secretary Ramesh Chennithala and former State Minister V.M. Sudheeran were the likely candidates, the CPI(M) has found good candidates in C.S. Sujatha (Alappuzha district panchayat president) and Dr. Manoj Kurisinkal (independent, a doctor by profession and president of the Alappuzha Latin Catholic Association). The CPI had lost all the four seats it contested in 1999. The party is contesting all the four seats this time too, with more hope. The UDF, then in Opposition, had won 11 of the 20 Lok sabha seats in Kerala in 1999. 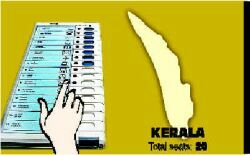 Eight were won by the Congress(I), two by the Indian Union Muslim League (IUML) and one by the Kerala Congress(Mani). The Kerala Congress(Mani) ’s MP from Moovattupuzha, P.C. Thomas, later quarrelled with his leader, K.M. Mani, over the latter’s attempts to promote his son Jose K. Mani in politics. Thomas formed the Indian Federal Democratic Party (IFDP), joined the NDA and became a Union Minister. It is therefore a tough three-cornered fight in Moovattupuzha too. However, P.C. Thomas, who used to win with record margins from the constituency, is now the NDA’s candidate fighting Jose K. Mani, the UDF candidate, and the LDF’s P.M. Ismail. In Manjeri and Ponnani, where IUML candidates regularly win with a brute majority, the party has decided to change its candidates this time. IUML general secretary E. Ahmed, the sitting MP from Manjeri, is now to contest from the neighbouring Ponnani constituency, usually the preserve of party national president G.M. Banatwala. In Manjeri the party has decided to field former MLA K.P.A. Majeed. The CPI(M) candidate in the constituency is also a former MLA, T.K. Hamsa, which makes for a keen contest. The BJP has fielded Uma Unni (who shot to fame as a representative of Hindu fisherwomen at the communally sensitive Marad in Kozhikode district) as its candidate in Manjeri. ALTHOUGH the phase of alliance-making is over in Karnataka, which goes to polls on April 20 and 26, the relative strengths of the three main political formations, namely the Congress(I), the Bharatiya Janata Party, and the Janata Dal(Secular), are by no means clear. A major difference in the electoral scene between 1999 and 2004 is the contraction in the size and influence of the Janata parivar that traditionally attracted a sizable chunk of anti-Congress(I) and anti-BJP voting segments in the State. Today the JD(S) has consolidated itself around the person of former Prime Minister H.D. Deve Gowda. The Janata Dal(United), the political legacy of former Chief Minister Ramakrishna Hegde, crumbled after his death. A section of the party had transmuted itself into the All India Progressive Janata Dal (AIPJD) even while Hegde was alive. After his death, the AIPJD split, with one faction joining the Congress(I), and the other led by S.R. Bommai, failing to make common cause with the National Democratic Alliance (NDA), rejoining the JD(U). The electoral contest in the State is, therefore, essentially a three-cornered one. Behind the Congress(I) government’s decision to opt for simultaneous elections was a shrewd political calculation. Had the Lok Sabha elections been held before the Assembly elections, an NDA victory would have given the BJP a clear edge in the Assembly elections. By opting for simultaneous elections, the Congress(I) has denied the BJP that advantage and is going to the people on the strength of its own performance in office. Indeed, it appears to have upstaged the NDA in the propaganda war. The S.M Krishna government launched a major media offensive highlighting its pro-people schemes, a campaign that put the NDA’s `India shining’ crusade in the shade. The campaign had perforce to stop when the model code of conduct came into force, but the Congress(I) has been able to steal a march over its rivals through this state-funded voter outreach initiative. The Congress(I) believes that it has reason to feel confident about being re-elected with a bigger majority. In 1999, the Congress(I) won 17 of the 28 Lok Sabha seats, the BJP seven, the JD(S) one and the JD(U) three. Whereas it had 135 members in the Legislative Assembly at the beginning of the year, by the time of the dissolution of the Assembly on February 23, its effective support base had gone up to 154, as nine members of the AIPJD and two independents joined the party, and eight expelled BJP members extended their support. During its five years in office, the Congress(I) strengthened its base by sweeping the elections to the local bodies. In the October 2003 elections to 25 seats that had fallen vacant in the Legislative Council, the Congress(I) won 20, followed by the JD(S) and the AIPJD with two each. These figures cannot, however, mask the extent of popular disenchantment with the government’s performance, something the Congress(I) election managers are unwilling to recognise. The party has been claiming the credit for making Karnataka the hub of the Information Technology and biotechnology sectors in the country. It has highlighted its investment in major and minor irrigation, the success of its free midday meal scheme in government primary schools, its rural housing initiative and its health insurance scheme for the poor. The State has faced a severe drought in three out of the five years of Congress(I) rule, but drought relief has been inadequate and mismanaged. The government’s attitude towards the phenomenon of farmers’ suicides is seen as callous, particularly the tardy way in which compensation has been paid to the debt-ridden families of suicide victims. With reduced agricultural work there are mass migrations of peasants and agricultural workers to the cities. There have been job losses among workers owing to closure of industries and privatisation of the State sector, and growing poverty within the unorganised workforce. The discontent arising from these factors cannot but find expression in the way people vote. But neither the BJP nor the JD(S) has been able to fully take advantage of this mood. The BJP has emerged as the principal opposition to the Congress(I) in coastal and northern Karnataka, while the JD(S) is in a strong position in its traditional areas of strength in the Old Mysore region comprising the districts of Hassan, Kolar, Tumkur, Mandya, Mysore and Chamarajnagar. The disintegration of the JD(U) has left a political vacuum in northern Karnataka. A prize political catch for the BJP has been former Congress(I) Chief Minister S. Bangarappa, one of the few mass leaders left in the State. His induction will improve the prospects of the party in Shimoga and Uttara Kannada districts where Bangarappa has a substantial following among the backward castes and minorities. But this is a political crossover that is seen as both unprincipled and opportunistic. Bangarappa, whose name is associated with major corruption scams, and who is known to have little compunction in shifting his political loyalties, was the target of the BJP’s criticism until the day before he joined the party. It is Deve Gowda who carries the mantle of the "third front" in Karnataka, or what remains of its once strong presence. The JD(S) is slowly consolidating its position through the induction of new members and through a low-key mass contact programme by its leaders, particularly Deve Gowda. Deve Gowda is known for his ability to revitalise swiftly his support base. There has been a steady flow of people from various fields of public life into the party. 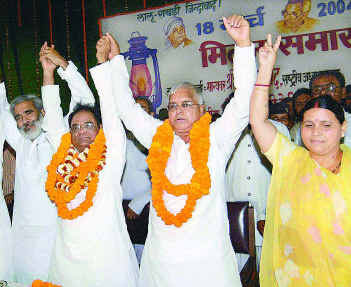 Former Ministers and leaders of the erstwhile JD(U) M.P. 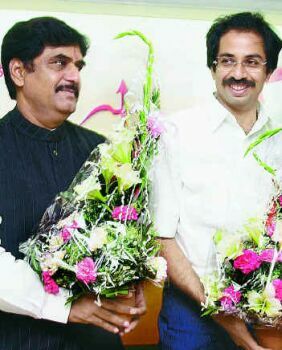 Prakash and P.G.R. Sindhia, popular Kannada actor Ananth Nag, Pramila Nagappa, wife of H. Nagappa who was kidnapped and killed by forest brigand Veerappan and Mahima Patel, the son of former Chief Minister J.H. Patel have joined the JD(S). 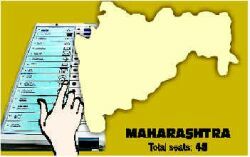 PROMISES, counter-promises, games of one-upmanship and the announcement of a series of populist measures have marked the beginning of the election season in Maharashtra. It is an unusual sort of beginning to a campaign: unlike previous occasions, there are relevant issues to be addressed, but all parties seem to have decided to ignore them at least for the time being. A drought in several districts, scarcity of drinking water even in certain urban areas, issues related to the marginalised and minority communities, increasing debts of farmers, the demand for the creation of a separate State of Vidarbha and housing problems in Mumbai are just some of them. 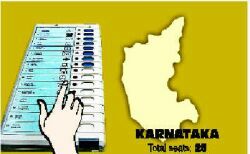 The State, which has 48 Lok Sabha seats, goes to the polls in two phases on April 20 and 28. However, the battle lines are clearly drawn. So far there has not been any major political realignment in the State. Rumours of a possible tie-up between the Shiv Sena and the Nationalist Congress Party (NCP) have been proved wrong. The Sena continues to be an ally of the Bharatiya Janata Party (BJP) and the NCP that of the Congress(I). While the BJP hopes to make substantial gain in eastern Maharashtra because of its support for the creation of Vidarbha, the NCP continues to place its hope on western Maharashtra. The BJP plans to attack the NCP on its home ground by focussing on the problems faced by the sugar cooperatives. In rural areas, the politics of sugar cooperatives is expected to play its traditional role of influencing voting. A BJP activist said: "Onions made us cry in the 1998 elections. This time we will make sugar turn bitter for the Congress(I) and the NCP." The absence of any coherent drought relief plans is expected to play a pivotal role in the 11 drought-affected districts of the State. Both the Shiv Sena and the BJP have announced that their main quarry is Sharad Pawar’s NCP. The BJP has targeted the NCP by enticing away NCP leaders. The Sena, on the other hand, is waiting for former Deputy Chief Minister Chhagan Bhujbal, who had quit following the stamp paper scam, to be back in the public eye to attack him. The biggest blow to the NCP has been the stamp paper scam. Although its genesis is traced back to the days of the Sena-BJP coalition government, the Democratic Front (D.F.) government of the Congress(I) and the NCP has borne the brunt of the criticism. Although Bhujbal’s resignation was ostensibly provoked by an attack by his supporters on the office of a private television channel, it is increasingly believed to have been a pre-emptive move by the NCP to prevent embarrassment in the wake of allegations linking Bhujbal and Abdul Karim Telgi, the alleged mastermind of the scam. The BJP too is facing internal problems. When BJP Member of Parliament from Beed (which includes State BJP president Gopinath Munde’s Assembly constituency) Jaisingrao Gaikwad Patil left the party to join the NCP, he said: "When alcohol permeates the body, reason automatically leaves." He added that Munde and former Union Minister and party general secretary Pramod Mahajan were "drunk with power", had made the State BJP "money minded", "ignored the power base of the BJP, the cadre, and gave importance only to fund-raisers". In the Sena the rift between cousins Uddhav and Raj Thackeray continues to pose a problem for the party though, with the elections round the corner, they are frequently seen on the same platform. Meanwhile, the Sena has been working hard to get rid of its reputation as being a party prone to violence. An important component of the strategy is the "Mee Mumbaikar" campaign, which is designed to promote the spirit of being a resident of Mumbai and which promises to create more employment opportunities. Even the attack on Biharis who had come to Mumbai for a Railway Recruitment Board examination in November 2003 is all water under the bridge as far as the Sena is concerned. Interestingly, after disassociating itself from the vandalism at the Bhandarkar Oriental Research Institute in Pune, the Sena has accepted the support offered by the Akhil Bharatiya Maratha Mahasangh, which claimed responsibility for the act, to the alliance. The Mahasangh is an influential body representing the State’s Maratha community and has about 35,000 life members. The development is expected to divide Maratha votes between the Hindutva parties and the Congress(I)-NCP combine. Both the Congress(I) and the NCP have promised to give Mumbai top priority in their campaign. They have promised to construct more link roads to lessen the traffic congestion, hasten slum redevelopment, provide homes to unemployed mill workers and provide more funds to revive the city’s economy. The Shiv Sena has halted all drives by the party-controlled Brihanmumbai Municipal Corporation (BMC) to remove encroachments. The Mumbai-centric plan is seen as an attempt to reinvigorate the sources in the city that used to fund the Congress(I) but, of late, seem to have run dry. For its part, the BJP has been working at strengthening its base. The party claims the support of big business houses but declined to name any. The BJP started its campaign as early as October 2003 and is the only party that has come out with some sort of a campaign plan. Munde said: "Speedy and equitable development; Vajpayee’s character, capacity, calibre and conduct; and `India on the move’ will be our three guiding points." The three-point programme also indicates whom the BJP considers as its priority target groups. The first is a direct appeal to the middle class and the industrialists. The second alludes to Sonia Gandhi’s "foreign origin" issue. And the third aims at non-resident Indians (NRIs) whose financial support has increasingly been made available to the BJP. In February, Chief Minister Sushilkumar Shinde brought nine castes and sub-castes under the Other Backward Classes (OBC) category and the nomadic and denotified communities list, thereby awarding members of these communities land that was partly paid for by the government. In another move, Shinde also announced his intention to rename Nagpur airport as Dr. Babasaheb Ambedkar Dikshabhoomi International Airport. Both moves are aimed at the voters in two regions where the Congress(I) and the NCP have either been traditionally weak (as in the Konkan, where the Gamit community has received an OBC status) or been steadily losing ground (as in the case of Nagpur, where the BJP has been gaining ground largely owing to its pro-separatist stance on Vidarbha). This was followed by the move to prevent bars from being named after a religious figure. The plan, it turned out, was the brainchild of the wife of Minister of State for Home Kripa Shankar Singh. However, the ban was lifted even before it was applied. Another populist order of the State government was to allow liquor shops to do business on Holi, when they have traditionally remained closed to discourage anti-social behaviour. Perhaps the most bizarre election gimmick was the sudden announcement by Shiv Sena supremo Bal Thackeray that stray dogs kept him awake all night by their barking and should therefore be killed. However, popular opinion was against it. A letter to the editor in a local paper noted that it was "Bal Thackeray’s conscience and not the strays that were keeping him awake at night". WILL the Bharatiya Janata Party repeat its performance in the 1999 Lok Sabha elections, when it won 16 of the 25 seats in Rajasthan? This is the question doing the rounds in political and media circles in the State, which witnessed a BJP victory in the Assembly elections of December 2003. The Lok Sabha contest, by and large, will be a bipolar one - between the Congress(I) and the BJP. Observers point out that a third front is not likely to emerge. The Bahujan Samaj Party (BSP) and the Indian National Lok Dal (INLD) too are likely to field candidates. The BSP has, at the time of writing, announced candidates for 14 seats. The Communist Party of India (Marxist) has fielded Amra Ram, the sitting MLA from Dhod, from the Sikar parliamentary seat and Sheopat Ram Meghwal, vice-president of the Students Federation of India (SFI), from the reserved seat of Ganganagar. The Congress(I) seems to have learnt some political lessons since the 13th Lok Sabha polls, when it had to be satisfied with just nine seats. The first thing that it did post-Assembly elections was to appoint veteran legislator Narain Singh, a member of the Jat community, Rajasthan Pradesh Congress Committee(I) president. Currently the legislator from Danta Ramgarh, Narain Singh won with a comfortable margin in the Assembly elections. His appointment is attributed to the perception that the Jat community had voted against the party in the Lok Sabha and Assembly elections. Moreover, the reservation to the Jat community, promised by Prime Minister Atal Behari Vajpayee during his campaign and the lacklustre performance of the Ashok Gehlot-led government had helped the BJP gain the upper hand in 2003. The Congress(I) released a chargesheet against the BJP on March 18, the day Chief Minister Vasundhara Raje Scindia completed 100 days in office. The party is also planning an elaborate campaign by its president Sonia Gandhi in the coming days. The PCC president emphasised that special attention will be devoted to the reserved constituencies, given the erosion of the Scheduled Caste and Scheduled Tribe base of the party. Meanwhile, though the BJP camp seems upbeat, the delay in announcing candidates indicates that all is not well in the party. 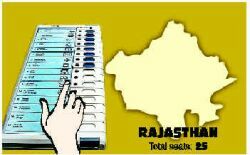 A four-member panel comprising Vasundhara Raje Scindia, State party president Lalit Kishore Chaturvedi, Cabinet Minister Gulab Chand Kataria and party organising secretary Prakash Chandra are to finalise the names of the candidates. The first blow came when Pratap Singh Khachariyawas, former BJP member and nephew of Vice-President Bhairon Singh Shekhawat, joined the Congress(I). Khachariyawas was an aspirant for the BJP ticket for the Bani Park Assembly seat in the Jaipur Lok Sabha constituency but was denied that despite the backing of Vasundhara Raje Scindia. Although Jaipur is a BJP stronghold given its strong urban middle class population, Khachariyawas, if given the Congress(I) ticket, may prove to be a tough contender. He polled more than 70,000 votes contesting as an independent in Bani Park in the 2003 Assembly elections. The second major problem for the BJP emerged over the nomination of the candidate for Banswara, considered a stronghold of the Janta Dal (United). It was learnt that while the BJP’s central leadership was keen to give the seat to its ally, the State unit had some problems. "The BJP will win," says Pushp Jain, the sitting MP from Pali. He says, joined by Pradyuman Kumar, a party secretary, that there is no anti-Central government feeling among the people and that it was felt that there was no alternative to the BJP. Pradyuman Kumar says that the BJP’s electoral success will also depend a great deal on booth management by its cadre, as was evident in the December 2003 elections. "We got a direct benefit from that," he said. As for the BJP’s new-found presence in the tribal constituencies, he said that the party’s strength had been on the rise for the last several years. "The activities of the Vanvasi Kalyan Parishad and the Ekal Vidyalayas made us politically active in these belts. Culturally, too, we tried to bring ourselves closer to them by adopting their ways and customs. That’s how we won their hearts," he said. Two events of political significance took place in the State in the second week of March. One was the annual Pratinidhi Sabha of the Rashtriya Swayamsewak Sangh (RSS), and the other was a convention of the Sewa Dal, a volunteer organisation of the Congress(I). The RSS meeting, held in Jaipur for the first time, endorsed the "India Shining" campaign and praised the five-year tenure of the BJP-led NDA government. The meeting, in the words of RSS Sahkaryavah Mohan Bhagwat, was meant "to firm up the direction of our future work, review and critically appraise it and also prepare plans in order to enhance the pace of our activity". However, it ultimately turned out to be more about shoring up organisational support for the BJP in the coming elections. The Pratinidhi Sabha consists of RSS representatives from all over the country and assumes significance in that all its senior functionaries are present. If the Sewa Dal meeting is any indication, the Congress(I) too seems to be in a mood of introspection. Senior leaders such as All India Congress Committee(I) member Janardan Dwivedi and former Chief Minister Jagannath Pahadia addressed the Sewa Dal workers and emphasised the need to work jointly. Mohammad Mahir Azad, the MLA from Nagar in Bharatpur district, went to the extent of saying that the Congress(I) may have lost owing to its arrogance and that now it was the "BJP’s turn to learn a lesson". Dwivedi pointed out that while the Gehlot government had done good work, the electorate was peeved by the activities of some leaders in the party. He also tried to draw a distinction between the economic liberalisation policies of the Congress(I) and those promoted by the BJP. ABOUT the only sign of the Congress(I)’s presence in Jammu are a few tattered plastic flags strung across the road from the airport to the city. The flags, it turns out, were put up to greet visiting party dignitaries after the party’s sweeping triumph across the Jammu province in the 2002 Assembly elections. Now, they are evidence of how much more durable polyvinyl chloride is than political fortunes. Battered by the furore generated by furious debate over the rights of women in Jammu and Kashmir to marry outside the State, the Congress(I) is witnessing the wages of vertical communal polarisation. In the Kashmir Valley, its ally, the People’s Democratic Party (PDP), is working overtime to displace the Congress(I), and emerge as the sole voice of opposition to the National Conference(N.C.). In Jammu, both the Bharatiya Janata Party (BJP) and the National Panthers Party (NPP) are charging the Congress(I) with having sold out to Kashmiri chauvinism, and of having failed to defend the region’s interests. In this emerging four-horse race, the prize is most likely to go to aggressive regional and communal chauvinists. The Congress(I)’s conspiracy theorists in Jammu have been murmuring about a tacit alliance between the PDP and the BJP, the two main beneficiaries of the Permanent Residents (Disqualification) Bill - a claim buttressed by Chief Minister Mufti Mohammad Sayeed’s effusive praise of Prime Minister Atal Bihari Vajpayee. It all began in October 2002, when a three-member Bench of the Jammu and Kashmir High Court passed judgment on challenges filed by 12 women against their having been deprived of permanent resident status on having married men outside the State. Justices V.K. Jhanji and T.S. Doabia upheld the women’s appeals and Justice Muzaffar Jan dissented. The N.C. government put off a debate on the issue by filing an appeal in the Supreme Court. Soon after assuming power, PDP MLA and Law Minister Muzaffar Beig, himself a lawyer, quietly withdrew the appeal; legal consensus held that it had no chance of success. On election-eve, however, opportunism triumphed over legal sense. The PDP needed an issue on which it could show that the party was the sole spokesperson for ethnic Kashmiri Muslims, more committed to their cause than the N.C. In Jammu, the BJP needed an issue through which it could show that it, rather than the Congress(I), was truly committed to defending the rights of the region. In the Disqualification Bill, both parties found just what they needed. Interestingly enough, all parties backed the Bill when it was presented to the Assembly in February, bar the BJP. The lone BJP member, Jugal Kishore, absented himself at the time of voting; immediately after the Bill was passed, the party hit the streets. Sustained BJP protests in Jammu have found considerable support, and the party’s candidates for the Udhampur and Jammu Lok Sabha seats have made the issue a central motif of their campaign. Although the NPP has also attacked the ruling coalition on the issue, its case has not been helped by its presence in the government - and its voting record on the Bill. On the face of it, the arguments surrounding the Bill are absurd - and the Assembly’s course of action legally dubious. Contrary to the fulminations of the PDP, the BJP and the N.C., the Bill has relatively little to do with Article 370, which gives special status to the State. The only State to negotiate its terms of accession to the Indian Union, Jammu and Kashmir has its own Constitution. This Constitution grants special rights - to purchase land, for example, and to be elected to legislative office or hold State government jobs - to permanent residents of Jammu and Kashmir. Yet, it has passed unnoticed that the Jammu and Kashmir Constitution itself nowhere debars women who have married non-permanent residents from holding on to their status. Section 6 of Part III of the Jammu and Kashmir Constitution gives constitutional status to two notifications on permanent residents issued in 1927 and 1932. The notifications define as permanent residents (then called State subjects) all persons residing in the State before the reign of Maharaja Gulab Singh, those who settled there before the Samvat year 1942, and those who both settled in the State before Samvat year 1968 and also purchased property. Indeed, the notifications expressly record that "descendants of the persons who have secured the status of any class of the State Subjects will be entitled to become the State Subject of the same class." There is no qualification in the notifications about women marrying outside the State losing their status. All that exists is a mandate that women who acquire State Subject status through marriage shall hold on to this right as long as they reside in Jammu and Kashmir - a protective provision intended to safeguard the rights of women from outside the State. Quite plainly, the long-standing discrimination against women in Jammu and Kashmir has no constitutional sanction. Just how politically driven the ongoing debate is also becomes clear from a study of the plain language of the Jammu and Kashmir Constitution. As Justice Doabia noted in his concurrence, Section 10 of the Constitution expressly mandates that "permanent residents of the State shall have all the rights guaranteed to them under the Constitution of India." All, quite obviously, includes fundamental rights, on which the Jammu and Kashmir Constitution does not have a separate chapter. Since the Constitution of India bars gender discrimination, women in Jammu and Kashmir cannot be denied rights available to men. Where do things go from here? If the Congress(I) does stick to its guns on the Permanent Residents Bill, that ought to be the end of the affair. Section 9 of the Jammu and Kashmir Constitution notes that the Assembly does have the power to amend or alter the definition of who is a permanent resident, give them special rights, or modify their privileges. Such amendments, however, "shall be deemed to be passed by either House of the Legislature only if it is passed by a majority of not less than two-thirds of the total membership of that House" - something chauvinistic parties supporting the Bill do not possess. Congress(I) politicians are doing what they can to hit back. 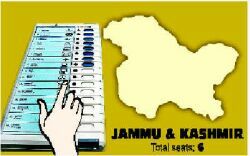 One key site of contestation is the Baramulla constituency. Soon after the PDP announced two alternative candidates for the seat, Congress(I) senior vice-president Abdul Gani Vakil noted that his party had won 80,000 votes in the Assembly segments comprising the constituency last year, to the PDP’s 30,000. The Congress(I), Vakil said, was not willing to surrender all seats in the Kashmir valley to the PDP, in return for exclusive rights to contest the two seats in Jammu, and one in Ladakh. If the feud is not resolved, all the members of the ruling alliance could end up contesting against one another - the Congress(I) and the PDP in Kashmir, and the Congress(I) and the NPP in Jammu. Nothing could suit the BJP, decimated just 18 months ago, better. 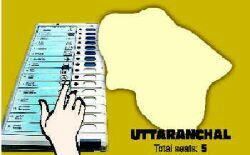 Despite its strong presence in the undivided Uttar Pradesh, and despite the fact that it was the BJP-led National Democratic Alliance government at the Centre that created Uttaranchal in November 2000, the BJP won only 19 of the 69 seats it contested in the 2002 elections to the 70-member State Assembly and 25.45 per cent of the votes. The Congress(I) won 36 seats, with 26.91 per cent of the votes. Now the situation seems to have changed a bit. As the ruling party, one would expect the Congress(I) to be comfortably placed to win most of the seats. Surprisingly, this is not the case. The party has not consolidated its position. Two years after the Assembly elections, the BJP senses that the Congress(I) government’s failures would work to its advantage. The BJP is harping on the NDA government’s achievements and projecting the clean image of Prime Minister Vajpayee. But the NDA’s "India Shining" hype has not impressed the people. "It may be shining for them, but there is nothing here to make us feel so," said Kanwal Singh Rawat of Rainapur near Rishikesh, even as he professes support for the BJP. But surely one thing that could pave the way for the BJP’s success is the construction of roads. "Even far-flung areas have now been connected with roads," says one village resident. And B.C. Khanduri, Surface Transport Minister and MP from Pauri Garhwal, is viewed as the man who did it. Had the Congress(I) retained its edge it acquired in 2002, its prospects would have been better, but indications are that it has not. Even the party’s internal survey, conducted in February, showed its chances were slipping. "It looks like 50-50 to me, if the selection of candidates is right," N.D. Tiwari said. He concedes there might have been shortcomings in meeting the people’s expectations; he blames paucity of funds for this. "We cannot work miracles in two years. I had the job of laying the plinth and I have ensured that at least there is no negative factor against either the government or the party," says the four-time Chief Minister of undivided U.P. In fact he earned the sobriquet "Vikas Purush" for the unprecedented development work that took place in U.P. during his tenure. He agrees that the laying of the roads, for which the Centre is getting the maximum credit, is the only achievement that the people seem to take into account. "There have been initiatives in the area of industry, tourism and Information Technology, which should start giving results in a couple of years. I have laid the foundation for them," he says. But lack of unity within the Congress(I)(State party president Harish Rawat is known to carp at Tiwari) and factionalism could detract the voters from the initiatives Tiwari claims to have undertaken. Except Nainital, which has been Tiwari’s bastion, Tehri is the only other seat where the Congress(I) can look for some gains. Manvendra Shah, the BJP MP and erstwhile ruler of Tehri state, has represented the constituency since 1991, but now people have started complaining about his nonavailability and lack of performance. Sensing this mood, the Congress(I) has fielded Vijay Bahuguna, son of the late H.N. Bahuguna who was Chief Minister of U.P. In Almora and Pauri Garhwal, where the BJP has renominated Bachi Singh Rawat and B.C. Khanduri respectively, the Congress(I) has absolutely no presence. Khanduri gets thumbs up for the good roads and Bachi Singh Rawat holds his own turf having defeated Harish Rawat continuously since 1991. In Haridwar, where the Congress(I) hopes to do well, the scale looks tilted towards the BJP. So there is no reason for the Congress(I) to feel optimistic. Interestingly, this is the only seat where the Bahujan Samaj Party (BSP) holds ground. Of the nine Assembly segments in the Haridwar Lok Sabha constituency, the BSP has won six and the BJP two. The ground realities now do not favour the Congress(I) in Haridwar. The one achievement that the Congress(I) tries to take credit for is the improvement of facilities for pilgrims participating in the Kumbh melas. But it is common knowledge that the NDA government provided Rs.135 crores to upgrade the facilities. Above all else, the BJP’s poll mascot, Vajpayee, has actually caught the people’s fancy in the hill State. "(Congress-I chief) Sonia Gandhi’s foreign origin is no big issue, but Atal Bihari Vajpayee scores on experience and performance," said Sapre Ram, a retired school principal in Rainapur village. THE situation on the ground in Haryana favours a vote for change. Indications are that the Indian National Lok Dal (INLD) and the Bharatiya Janata Party may find it difficult to retain the Lok Sabha seats won in 1999. The INLD and the BJP, which fought the 1999 Lok Sabha elections in alliance, won all the 10 seats, each winning five. There is palpable anger against the two parties in the towns and areas dominated by the Jat community, their traditional strongholds. Nowhere is this more evident as in Ghillod Kallan village in Rohtak constituency. It is common for women of the village to make more than a dozen trips to the village well for water. Tap water is unheard of in this village. A few kilometres away, in the village of Jassia, the situation is dismal. The hand-pumps set up on the village main road splutter out water infected with toxins. These hand pumps have led to a drastic decline in the water table of the village. The election manifestos of the major political parties promise safe drinking water. Said Jaswanti of Ghillod Kallan: "We know that this is the time to make promises. The problem of drinking water will not be solved by any political party. All they want is to stay in power." The village of Ladwa is 148 km from Delhi. Sugarcane is one of the major crops grown here. More than half a dozen families in the village have been plunged into financial crisis because of the fall in the price of sugarcane. Said Ramesh Kumar, a sugarcane farmer: "I sold my produce to private mills at the low price of Rs.83 a quintal. The cooperative sugar mills are not at all helpful. They fail to protect us from private owners who quote low prices. The cooperatives refuse to transport the crop. How can a poor farmer like me pay for transportation? I have no other option but to sell my produce to private owners." Ask him about the approaching Lok Sabha elections and Ramesh says that though he will vote against the sitting MP, he does not expect the next one to improve the situation. Basmati rice shops abound on the highway, which connects the village of Ramgarh with Ladwa. The traders in these shops complain how the Value Added Tax (VAT) - in effect since April 2003 - has destroyed their business. Customers who used to flock to Haryana to buy Basmati now prefer adjoining Punjab. Before VAT, a quintal of Basmati in Haryana cost Rs.200 less than that sold in Punjab. Now the sale price is more than that in Punjab. The traders in the State are thinking of floating a political party to lobby for the removal of VAT. In towns such as Panipat and Karnal it is inadvisable to travel after sunset. Recently, when Congress(I) leader Bhupinder Singh Hooda quoted statistics to back his charge of a worsening law and order situation in the State, nobody rose to counter his claims. Said Hooda: "Contrary to [Chief Minister Om Prakash] Chautala’s claim, the law and order situation in the State has deteriorated. The number of crimes reported increased from 33,081 in 1995 to 38,782 in 2000 and to 40,169 in 2002." Day-time robberies are common and have made cities as unsafe as the countryside, which is notorious for violent feuds. One of the main reasons for the anger against Chautala has been his dictatorial style of functioning. The INLD has moved towards increasing the centralisation of power. Within the INLD, there is no democratic functioning, and voices of dissent are nipped in the bud as control of the party has increasingly moved into the hands of Chautala and his son Ajay Singh Chautala. Charges of corruption against INLD leaders have affected the party’s image among the people. The BJP’s position is unenviable. Its four-and-half-year-old alliance with the INLD has meant that the BJP behaved neither like a ruling party nor as an effective Opposition. By itself the party has never had much influence in Haryana. Now, with the alliance with the INLD having come to an end, party workers are finding themselves fighting a losing battle. Said a BJP worker: "L.K. Advani and Sushma Swaraj never really wanted to work with the INLD. When a section of party workers said that the elections could be won independently on the `feel good’ factor, they were too ready to believe them. We are not feeling too good about this change." The BJP is aware that without an alliance with one of the regional parties it stands little chance of winning even one of its five seats. Earlier, in desperation, it made overtures to its former ally Bansi Lal, former Chief Minister and president of the Haryana Vikas Party (HVP). The two parties contested the 1998 Lok Sabha elections together but could win only one seat each. 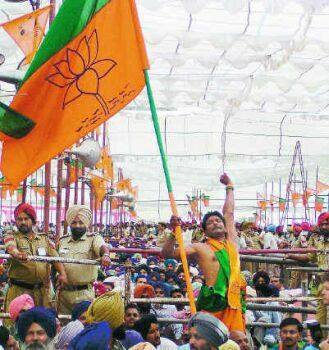 The BJP subsequently moved closer to Chautala. However, Bansi Lal, said to be angry with the BJP for its betrayal in the past, is not keen on bailing the BJP out of the political mess. He has said that his target is the next Assembly and not the Lok Sabha. The INLD and the BJP are bitter enemies now. Chautala reacted sharply to Advani urging the electorate to vote for a single party rather than regional parties. He wrote letters to leaders of all major regional parties asking them to "beware the sinister designs of the BJP in general and Advani in particular". Chautala is also blaming the BJP for increasing the price of diesel and other agricultural inputs. Political observes believe that if the Congress(I) fields the right candidates, it will gain from the anti-incumbency factor. The situation gets more complicated given the fact that no prominent Congress(I) leader wants to spoil his or her chances of becoming Chief Minister by standing for the Lok Sabha elections. Assembly polls are due in a year’s time and leaders such as Bhajan Lal and Bhupinder Hooda would like to stake their claim to chief ministership. Said a party functionary: "The situation is such that they will bow to the party high command if it decides to field them. Yet many of the candidates would be too happy to forsake the ticket for the present elections in favour of the Assembly polls." It is clear that even if factionalism does not affect the party in the Lok Sabha polls, it will affect it in the Assembly elections. FOR most people in Punjab, the sole uncertainty about the election outcome is just how badly the Congress (I) will do. Battered by a large-scale revolt of MLAs allied to former Chief Minister Rajinder Kaur Bhattal, Chief Minister Amarinder Singh seems to have little control over his party apparatus. Everything from the nomination of former Chief Election Commissioner M.S. Gill for a Rajya Sabha seat to the return of the Chief Minister’s Information Adviser, B.I.S. Chahal, have become causes for contention within the party; on top of it all, corruption scandals have broken out over State government jobs and recent auctions of liquor retail outlets. Yet, many of the problems faced by the Congress(I) exist within the Shiromani Akali Dal (SAD) and the Bharatiya Janata Party as well. Although former Chief Minister Prakash Singh Badal has made his peace with his archenemy, Gurcharan Singh Tohra, the two factions remain at odds on the ground. SAD cadre are also irked at efforts by Badal’s son, Sukhbir Badal, to run the campaign. Sukhbir Badal’s choice of youth leader Charanjit Singh Dhillon as the party candidate from Ludhiana, for example, has attracted allegations that the seat has been gifted to the Congress(I). The Congress(I) might be in big trouble - but it is still unclear if that will actually turn into a debacle. SAD leaders are hoping that southern Punjab will be the firm base on which their assault on the Lok Sabha will be founded. During the last Assembly elections, southern Punjab voters saved the SAD from a certain wipe out. Now, with the SAD hoping to sweep Punjab, the region has again acquired enormous significance. It is here the Congress(I) hopes to carry out a rearguard action, using its anti-corruption campaign against Badal to effect. While the Congress(I) has yet to finalise candidates, south Punjab heavyweight Jagmeet Singh Brar could prove a formidable campaigner for the party in both Faridkot and Ferozepur. The third key south Punjab seat, Bhatinda, has been given to the Congress(I) ally, the Communist Party of India. 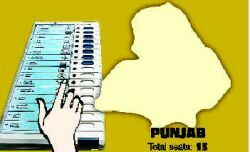 Dalit votes could be central to the outcome of the contest in the prosperous Doaba region. Jalandhar, for one, has seen enormous caste tension in recent months, after riots broke out between Dalits and the landed Jat community for control of a shrine in the village of Talhan. Although a truce was brokered between the warring communities, traditional Congress (I) voters in the Dalit community were incensed by the State government’s failure to back them. Former Prime Minister I.K. Gujral’s son, Naresh Gujral, is standing as the BJP candidate from this constituency - but some observers believe his own caste status could be an obstacle to harnessing Dalit residents to the SAD-BJP’s cause. It is clear, though, that the Congress(I)’s failure to put together an alliance with the Bahujan Samaj Party (BSP) will cost it a substantial number of votes. In 1999, BJP candidate Vinod Khanna won the Gurdaspur seat by just 3,000-odd votes, a victory brought about in no small part by the BSP taking 67,000 votes, which may otherwise have gone to the Congress(I). Although the BSP’s Punjab unit has been riven by factionalism - State leader Satnam Kainth has merged his faction back with the party, but discontent continues to simmer - it nonetheless remains a magnet for a large number of Dalit voters. While Amarinder Singh had hoped to build a counter constituency among landed farmers - great effort was made to ensure trouble-free procurement of crops - there is little sign of large-scale Jat desertion of the SAD so far. In some seats, inner-party issues, rather than wider caste and class alignments, could prove crucial. Patiala, for one, will witness a particularly interesting campaign, which will see elements of each major party pitted against their own. Parneet Kaur, Amarinder Singh’s wife, will be fighting to retain her seat in the contest against former State Finance Minister and SAD leader Kanwaljit Singh. Her problems will, of course, include discontent among traditional Congress(I) supporters in urban areas and Dalits - but also the influence of Bhattal among rural voters in the Lehra Gagga area. Cadre loyal to Bhattal, Parneet Kaur’s campaign managers worry, will do little to help the official candidate. Ironically enough, Kanwaljit Singh has a similar problem. Between December 1998, when the Badal and Tohra factions of the SAD split, and 2003, when they patched up, Kanwaljit Singh was among Tohra’s most bitter opponents. Now, both factions have patched up on paper. On ground, though, many block level workers allied to Tohra have been less than happy about conceding their positions to the official SAD, and their cooperation with Kanwaljit Singh’s campaign is less than certain. Tohra loyalist Prem Singh Chandumajra, who raised the banner of revolt after being denied the Patiala seat, has made his peace with the SAD - but not, local politicians say, with Kanwaljit Singh’s nomination. Similarly, in Sangrur, SAD candidate Sukhdev Singh Dhindsa will face opposition from sitting MP and Akali maverick Simranjit Singh Mann, from the Congress(I) - and from elements of his own party. Dhindsa is a long-time opponent of SAD heavyweight and former Chief Minister Surjit Singh Barnala. While Barnala has ostensibly stayed out of local politics since his appointment as Governor, his wife Surjit Kaur Barnala has announced her opposition to Dhindsa’s candidature. Many within the Congress(I) feel this mosaic of infighting would have given Bhattal a good chance of taking the seat, but the dissident leader has rejected proposals that she stand, seeing them as an effort to evict her from State politics. In Patiala - as elsewhere - the outcome of the Lok Sabha elections could make or break State-level political futures. Many observers believe major Congress(I) reverses could accelerate calls for Amarinder Singh’s head - unless, that is, the party faces all-India humiliation. "Amarinder Singh’s best bet," notes one senior Congress(I) politician, "is that the party does badly elsewhere. That way, no one will be able to point fingers at anyone." THE Bharatiya Janata Party, which won all sevens seats from Delhi in the last elections was first to declare its list of candidates. The Congress(I), which did not win a single seat in the last two Lok Sabha elections in Delhi, is yet to announce its list. 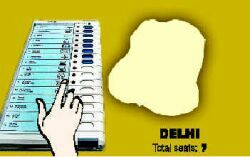 Polling for the seven parliamentary constituencies in the National Capital Territory of Delhi has been scheduled for the final phase, on May 10. While the BJP hopes to build its campaign around the achievements of the National Democratic Alliance (NDA) government, the Congress(I) hopes to capitalise on the popularity of the Sheila Dixit government, which won the 2002 Assembly elections comfortably. The BJP has re-nominated six of its seven Members of Parliament. Vijay Goel, the Union Minister of State for Sports and Youth Affairs and Member of Parliament from Chandni Chowk, is contesting from Sadar, which Madan Lal Khurana vacated when he was appointed Governor of Rajasthan. The Delhi Pradesh Congress Committee president criticised Goel’s decision with the taunt that it showed that the BJP no longer considered Chandni Chowk a safe seat. Goel was quick to respond: "Who is the Congress to tell me about which constituency to stand from, when they have not even finalised their candidates. I was born and brought up in Sadar constituency. In fact, my political career started in Sadar when I defeated Jagdish Tytler, a three-time member." But it is clear that the large Muslim population and Goel’s narrow margin of victory (1,995 votes) in Chandini Chowk in the last elections has prompted this move. Says Dr. Harsh Vardhan, president of the BJP’s Delhi unit: "We were clear about six candidates. Chandni Chowk is a constituency with a delicate balance - it is small and the victory margins are also small." The results in Chandni Chowk could also depend on the performance of the Janata Dal (Secular) candidate, Shoaib Iqbal, who has a strong vote base in this area. The Congress(I)’s chances depend largely on its choice of candidates. Party workers hope that the leadership has learnt form its past mistakes. The Congress(I) has lost three times in a row in the Outer Delhi and New Delhi constituencies, five times in a row in the East Delhi constituency and six times in South Delhi. Although any win for the Congress(I) will be an improvement, the party hopes to maximise its gains. In order to do this it needs to field the right caste combinations, especially in Outer Delhi and East Delhi, which are the largest constituencies, and have increasing migrant populations. The Congress(I) was quick to criticise the plans of Union Minister for Tourism Jagmohan, the BJP’s candidate from New Delhi, to relocate jhuggi-jhopri clusters in the Yamuna Pushta area as a part of his plans to beautify the river. 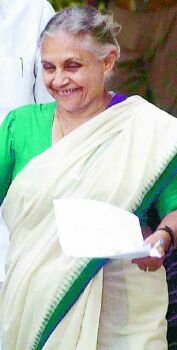 Chief Minister Sheila Dixit opposed the plans saying it would affect the right to vote of those being relocated. Says Dixit: "I have written to the Election Commission saying that I fail to understand the urgency of beautifying a place at the cost of affecting the right to vote of citizens living in the area. When the Election Commission had already given a directive saying that people should not be relocated till the elections are over, why cannot the government wait for some more time? When Jagmohan has not done anything for five to six years, why should he be in such a hurry now?" Despite its dismal showing in the Assembly elections (it won only 20 out of 70 seats), the BJP has started targeting the performance of the Delhi government. Says Dr. Harsh Vardhan: "The Delhi government is planning to impose property tax on the Unit Area method. It has hiked electricity and water tariffs. The government has given the Sonia Vihar Treatment Plant to the French company Degremont on a maintain-and-operate basis for almost 10 years. The Sheila Dixit government’s policies are very consumer-unfriendly." Although the Congress(I) is banking on the popularity of its government to improve its tally, Delhi’s history shows that the results of Lok Sabha elections could be different from those of the Assembly polls. Says Dr. Harsh Vardhan: "Look at the 1998 elections, we won only 15 seats in the State legislature but in the Lok Sabha elections, held six months later, we won all the seven seats." A statistic the Congress(I) is unlikely to forget in a hurry. Bahujan Samaj Party (BSP) chief Mayawati’s decision not to align with the Congress(I) must have brought some relief to the Samajwadi Party (S.P.) and the Bharatiya Janata Party (BJP). In the event of a BSP-Congress(I) pact, the S.P. was in danger of losing its substantial Muslim support and the BJP its upper-caste support. The results of the Lok Sabha elections are likely to be more or less on the same lines as those of the 2002 Assembly elections and the 1999 parliamentary elections. The S.P. emerged in 2002 as the largest party by winning 143 of the 403 Assembly seats and a 25.37 per cent vote share, followed by the BSP with 98 seats and 23.06 per cent of the vote share and the BJP with 88 seats and 20.08 per cent of the vote. The Congress(I) was a poor fourth with 25 seats and an 8.96 per cent vote share. In 1999, the BJP had bagged the largest number of Lok Sabha seats, 29, followed closely by the S.P. with 26 seats. The two parties secured 27.64 per cent and 24.86 per cent of the votes respectively. The BSP won 14 seats and 22.08 per cent of the votes. 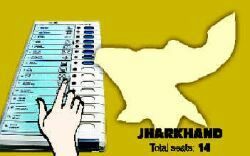 The Congress(I) had fallen by the wayside with only 10 seats and 14.72 per cent of the votes. This time round, the BJP’s performance is expected to register a significant change with the return of former Chief Minister Kalyan Singh to its fold. In the 2002 elections, the Rashtriya Kranti Dal (RKD), which Kalyan Singh formed after breaking away from the BJP, actively campaigned to inflict substantial damage to the BJP’s chances. It is another matter though that the RKD could not win many seats. During the Lok Sabha elections, although Kalyan Singh was with the BJP he actually sabotaged its prospects from within owing to differences with Prime Minister A.B. Vajpayee. Now that Kalyan Singh is prepared to lend wholehearted support, the mood in the BJP is upbeat. Deputy Prime Minister L.K Advani’s Bharat Uday Yatra is adding to the overall optimism. It is a matter of record that whenever Advani has undertaken a yatra he has attracted new voters to the BJP. Besides having been fielded from Bulandshahar, Kalyan Singh is also in charge of the BJP’s campaign committee. "We should cross the 50 plus mark provided we choose the right candidates. Vajpayee’s personality, the NDA government’s achievements and our programmes should see us through because the Opposition has no leader, no agenda and no programme," Kalyan Singh told Frontline in Lucknow, sifting through the list of ticket aspirants. According to him, the BJP’s task has been made easier by the poor performance of the Mulayam Singh government. "The crime graph has gone up in Uttar Pradesh and the people feel insecure," he said. Besides, sugarcane farmers were unhappy because their dues were still pending and there was no improvement in the employment sector. He vowed to expose the failures of the Mulayam government and he said, "The State is run by five capitalists who make policies in their own favour." As for the Congress(I), it remains painfully stuck in the quagmire that it has been in for several years. Moreover, the party’s hopes of improving its prospects by entering into an alliance with the BSP have been dashed. But despite Mayawati’s tongue-lashing and clear announcement that the BSP would contest all the seats in the State on its own, the party still hopes that some sort of an understanding would come about. "Have they announced their seats? Have they declared their candidates yet?" party spokesman Kapil Sibal asked in New Delhi, a day after Mayawati blasted the Congress(I) at her pardafaash rally (expose rally) in Lucknow on March 13. The only cause for optimism in the Congress(I) is the survey it conducted in February which showed an increase in its vote share since the last Assembly elections. It is pegged at over 15 per cent now because of a positive swing in the Muslim votes. Congressmen also feel that in a four-cornered contest, the importance of Uttar Pradesh in the overall picture would be reduced proportionately. "All the four parties would have their respective share of seats, and thus the importance of the State would go down," party general secretary Oscar Fernandes said. Yet the Congress(I)’s prospects certainly appear dim. In the last Assembly elections, 334 of the 402 candidates it fielded lost their deposits. In the Lok Sabha elections, 47 of the 76 candidates it fielded suffered such humiliation. The S.P. hopes to reap the benefits of the incumbency factor. It is banking on the fact that it is still too early for the anti-incumbency factor to set in. Besides, Mulayam Singh thinks that the initiatives his government has taken will see his vote share go up. "The sugarcane dues have been paid off to a large extent. The farmers are getting adequate power now. Besides, the Reliance power project and Sahara’s housing project will create avenues for employment. These and other initiatives, such as making education for girls free up to the intermediate level and providing free hospital beds, taken in the interest of the common people have been appreciated by people," Mulayam Singh said. He is also hopeful that the S.P.’s alliance with Ajit Singh’s Rashtriya Lok Dal will help increase its vote and seat share. "The Samajwadi Party will win not less than 50 seats, although our target is 60. We will decide who forms the government in Delhi," he said, hoping to play king-maker. The BSP, with its 22 per cent vote share, remains as confident as ever. Mayawati had adopted the simple yet electorally effective strategy of putting up a relatively larger number of upper-caste Hindus and Muslims. This has yielded rich dividends for the BSP so far. She hopes to become the balancing factor, irrespective of which party emerges as the single largest block. She is also nursing prime ministerial ambitions. "If people like Gujral, who have no grassroots support, can become Prime Minister, why can’t the leader of Dalits, who has such massive support, become one?" she asked at the Lucknow rally, making no secret of her intentions. 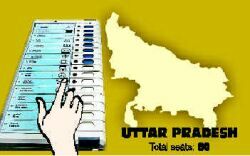 In Uttar Pradesh, the vote of Muslims would prove decisive in at least 36 constituencies where their strength varies from 40 to 45 per cent, the maximum being in Rampur where they form a substantial 52 per cent of the voters. In constituencies such as Saharanpur, Amroha, Moradabad, Bijnore, Meerut, Muzzaffarnagar, Deoria and Behraich Muslims constitute a substantial 40-45 per cent of the votes, a sizable number that can tilt the balance in any party’s favour. It is this realisation that is forcing the BJP too to woo Muslims. Without exaggeration, Uttar Pradesh does seem to hold the key to power. The battle promises to be exciting, with high-profile candidates like Vajpayee, Human Resource Development Minister Murli Manohar Joshi and Congress(I) supremo Sonia Gandhi contesting from the State. "IF the rest of India is feeling good, Chhattisgarh is feeling better," claims Brij Mohan Agarwal, senior Bharatiya Janata Party leader and State Home Minister. He has every reason to feel confident, as his party is likely to retain the majority of 11 seats in the State in the Lok Sabha elections. In the last parliamentary elections, when the region was still part of Madhya Pradesh, the BJP won eight seats. With the recent Assembly election victory, the morale of the BJP seems to be high. A demoralised and internally riven Congress(I) does not seem equipped to challenge the BJP. However, the post-Assembly election situation in the State has radically changed with the suspension of former Congress(I) Chief Minister Ajit Jogi from the party. Jogi was blamed for the setback the party suffered in the areas dominated by tribal people. The party managed to capture a mere eight out of 34 seats in the region, previously a Congress(I) stronghold. Moreover, it lost all 20 seats in the Naxalite-affected areas to the BJP. Now, with Jogi’s exit, the Congress(I) is hopeful of regaining lost ground. "There has been a drastic change in the ground situation," says Congress(I) leader S.C. Shukla, now that Jogi is no longer the face of the party in the State. Yet it seems unlikely that such a definitive change of preference in the tribal areas could have happened in a matter of a few months. "Jogi or no Jogi, there is no doubt that we have definitely won over the tribal people," says Nand Kumar Sai, a BJP leader who is contesting from Surguja, currently a constituency held by the Congress(I). The shift in the tribal vote in favour of the BJP is attributed to the activities of the Rashtriya Swayamsewak Sangh (RSS)-affiliated Vanvasi Kalyan Ashram. The outfit provides schooling and health services and insidiously creates a support base for the Hindu Right, which the BJP exploits in the elections. Besides the fall in tribal votes, what hurt the Congress(I) most in the Assembly polls was the presence of former party leader V.C. Shukla’s Nationalist Congress Party (NCP), which walked away with 7.38 per cent of votes, which would otherwise have gone to the party. This time V.C. Shukla has merged ranks with the BJP. But the Congress(I) believes that this move would be unpalatable to his supporters. "They may have been temporarily displeased with the Congress, but they will never vote for the lotus symbol," said S.C. Shukla. The BJP itself is cautious about quantifying the electoral gains owing to V.C. Shukla’s entry into its fold. Both Chief Minister Raman Singh and Sai expect the BJP to gain 3 to 4 per cent more votes thanks to V.C. Shukla. A significant development in the Assembly elections was that the Congress(I) made inroads into urban areas like Bilaspur, a change that is attributed to the economic growth and industrial progress achieved during the three years of Jogi’s administration. This time, the Congress(I) has fielded promising candidates like Dr. Basant Pahare from Bilaspur and the backward-caste MLA Bhupesh Baghel from Durg. While the NCP has virtually disintegrated with V.C. Shukla’s exit, the Bahujan Samaj Party (BSP), which secured 4.4 per cent of the votes polled in the Assembly election, can tilt the balance in Dalit-dominated areas like Sarangarh. Meanwhile, the absence of Jogi from the Congress(I) campaign has created a power vacuum, which might undercut the party’s chances. "Jogi nahi to Congress nahi ," said a party worker. He said that the current leadership, comprising Chhattisgarh Pradesh Congress Committee president Motilal Vora, S.C. Shukla and Charandas Mahant, could not mobilise the "frustrated, directionless workers". The three are united by a common antipathy to Jogi, but not sufficiently prepared to lead the party to electoral victory. "I want to transform the current crowd of Congress workers into a formidable army," says S.C. Shukla. However, in the Assembly elections, the BJP won seven out of eight seats in Shukla’s parliamentary constituency of Mahasamund, causing the veteran leader to shift base to Raipur (where he is pitted against Ramesh Bais of the BJP). "When people like Shukla and Vora could not get their own sons elected, how will they keep the Congress afloat?" asked a Congress(I) worker. In the BJP camp, former Union Minister Dilip Singh Judev, who had been caught on camera accepting money, is not contesting the election but is all set to campaign for the party. When questioned about the propriety of the matter, Aggarwal said: "Politics mein jeet hi moral hain (in politics, winning alone is moral). And anyway, his bold image and his immense popularity among the people shows that they have already rejected the accusation against him." However, local considerations apart, both the Congress(I) and the BJP claim that their victory is certain, given the national mood. While Congress(I) president Sonia Gandhi’s roadshow passed through Chhattisgarh on March 20, Advani’s yatra is slated for April 10. Chief Minister Raman Singh asserts that this election will be won on the basis of the Central government’s support for Chattisgarh’s development as seen in the reorganised railway zone and new power projects. S.C. Shukla, on the other hand, says that the Central government’s betrayal of the unemployed will create trouble for the BJP and effect a total reversal of fortunes in Chattisgarh. Vora said: "For the first time, farmers have been denied the minimum support price by this irresponsible government. Instead of that `jod-tod ki sarkaar’, we present 45 years of development under Congress administration." Either way, the core issues of this election are yet to emerge, as the campaigns have yet to gain momentum. 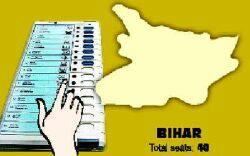 FOR over three years one has repeatedly heard from political analysts in Bihar that the next Lok Sabha polls in the State would be different from previous such exercises. The contention is that since its geographical division on November 15, 2000, for the creation of Jharkhand, several factors that had influenced the election process have moved out literally. These include political outfits such as the Jharkhand Mukthi Morcha (JMM) and ultra-Left groups such as the Maoist Coordination Committee (MCC), which drew their support largely from the tribal and marginalised communities concentrated in the districts that became part of Jharkhand. The number of Lok Sabha seats in Bihar also got reduced to 40 from 54 following the geographical division. In the absence of localised forces, it has also been contended that elections 2004 will essentially be a bipolar affair involving the National Democratic Alliance (NDA) and a secular front under the leadership of the Laloo Prasad Yadav-led Rashtriya Janata Dal (RJD). While these arguments do reflect sound socio-political logic, it is clear in the run-up to the polls that the political processes relating to elections have not changed dramatically in Bihar. All the political games that have characterised past elections are back in full play. On the one hand, the problems faced by the secular parties threaten to prevent the formation of a broad anti-NDA alliance. On the other, internal tussles could affect the prospects of the NDA, which has the self-professed objective of improving on its previous tally of 30 seats. One set of key players in the game of realpolitik has included parties such as the Congress(I), the Communist Party of India, the Communist Party of India (Marxist), the Nationalist Congress Party (NCP) and the Lok Jan Shakthi Party (LJP) led by Ram Vilas Paswan. The LJP was part of the NDA in the last polls but left it proclaiming that "a secular alliance was the only way to save Bihar and India". Basically, it is the demands for seats made by these parties that have prevented the formation of a secular front. Sections of the State Congress(I) have demanded 22 seats, the LJP wants at least 12, the CPI six, the CPI(M) two and the NCP one. The RJD wants to contest a minimum of 30 seats. So cumulatively there is a demand for 73 seats out of a possible 40. The RJD, the leader of the prospective combine, has branded the demands of other parties as "unrealistic, overambitious claims that have the sole objective of capitalising on our mass base". Laloo Prasad Yadav made one unsuccessful trip to New Delhi to sort out the issues with leaders of the other parties and was getting ready to make one more foray to the capital at the time of writing this report. During his first trip Laloo and other leaders arrived at an agreement granting Bhagalpur to the CPI(M) and Katiahar to NCP leader Tariq Anwar. Indications from the "secular camp" after Laloo Prasad’s return are that much headway has been made in the informal negotiations with parties other than the CPI. The CPI, which unilaterally announced its candidates for four seats, has apparently fallen out of favour with the RJD leadership. An effective, unified secular platform is also threatened by the decision of the Samajwadi Party (S.P.) to contest all the seats in Bihar. The S.P. does not have much of a presence in the State but may have enough nuisance value for the RJD. The CPI(Marxist-Leninist), which has a notable presence in a few constituencies, is also fighting on its own against both the NDA and the RJD. The CPI, by all indications, will throw its lot with the S.P. if it is not "accommodated respectfully" in the RJD led front. The NDA has, after much internal wrangling, finalised the sharing of 38 seats between its two main components in the State, the BJP and the Janata Dal(United). As per the agreement the JD(U) will contest 21 seats and the BJP 17. However, even as the NDA leadership was finalising the arrangement, several influential State-level leaders chose to disassociate themselves from the alliance. The list includes senior politicians such as Mangani Lal Mandal, Raghunath Jha and Devendra Prasad Yadav. The Selection of candidates has also caused hiccups in the NDA. The BJP’s decision to field Susheel Kumar Modi, Leader of the Opposition in the Assembly, from Bhagalpur has not been taken well by a section of the party. So much so that this section organised a Bhagalpur bandh to protest "the import of an outsider". The departure of Paswan from the NDA and the resultant loss of Dalit votes from almost all constituencies have created some confusion among senior leaders over the safety quotient of their seats. Even Janata Dal(U) leaders Nitish Kumar and George Fernandes, apparently swayed by the Paswan factor, are finding it difficult to make up their minds about whether to stick to Barh and Nalanda constituencies respectively or move out. But this confusion does not reflect in the NDA’s campaign. The developmental gains made by the NDA under Atal Bihari Vajpayee’s leadership, the work done by Union Minister Nitish Kumar in Bihar - the State got a large number of railway projects in the past five years - and the "misrule of the RJD government" form the thrust areas of its campaign. The secular formation’s campaign revolves around the "hypocrisy of the India Shining slogan" and "the threat of communal fascism posed by the Sangh Parivar". However, here also a common approach is conspicuous by its absence. The S.P., the CPI and the CPI(M) have also highlighted the misrule of the RJD. Clearly, the RJD has to contend with a `political fatigue’ factor too along with other problems. "SINCE its formation three years ago, Jharkhand seems to be continuously in competition with its parent State Bihar in perpetuating social and political chaos." This was the observation made by a senior bureaucrat recently. This comment fits the pre-poll political situation in the State too. What you see in Jharkhand is political pandemonium. It is led by the Bharatiya Janata Party, which holds 12 of the 14 Lok Sabha seats in the State. The BJP is not only facing problems with its partner in the National Democratic Alliance (NDA), the Janata Dal(United), but also has serious internal differences. Two senior leaders, Chief Minister Arjun Munda and former Chief Minister Babulal Marandi, are leading the intra-party tussles, each trying to obtain greater influence and control over the party and thereby get the majority of nominations for his supporters. Caught in the crossfire is External Affairs Minister Yashwant Sinha, who is in charge of the campaign in Jharkhand. The BJP’s current problems with the JD(U) stems from the latter’s demand that it be allocated four seats. Apparently, four State Ministers belonging to the JD (U) - Lalchand Mahto, Ramesh Singh Munda, Madhu Singh and Baidayanath Ram Seerms - are eager to try their luck in the Lok Sabha elections. The BJP has refused to concede any seat: Yashwant Sinha even said that "they (JD-U) can fight all the 14 seats and it will make no impact on the BJP". The JD(U) responded by saying that if the BJP did not allot four seats, it would contest all the seats. On the other side, Opposition parties such as the Rashtriya Janata Dal (RJD) and the Jharkhand Mukti Morcha (JMM) have in principle agreed on an alliance. The Congress(I) and the Communist Party of India are also engaged in talks with these two parties in order to reach an electoral understanding. But this process too is caught in claims and counter-claims. The RJD wants to contest 10 seats, the CPI four and the Congress(I) and the JMM six each. Despite these over-reaching demands, the negotiations, according to RJD leader Girinath Singh, are proceeding smoothly. There is a kind of resolve in the Opposition camp to prevent the NDA from repeating its previous performance. The menace of anti-election violence by ultra-Left forces such the Marxist Coordination Committee (MCC) also looms over Jharkhand. Several clashes have taken place in the past one month between the MCC and militant outfits of upper-caste organisations. GONE were the awkwardness and edgy nervousness of the previous years. Actually, Orissa Chief Minister and Biju Janata Dal president Naveen Patnaik had a spring in his step as he strode up the dais at Saradhabali in Puri to kick-start the electoral campaign of the BJD-Bharatiya Janata Party alliance in February. After seven years in politics, Patnaik seemed to have discovered himself. The chuckles from a part of the crowd over his ignorance of Oriya died down after he spoke for five minutes in his native tongue about fighting corruption and fulfilling his father’s dream of building a prosperous Orissa. Although he read out the speech written in the Roman script, for the first time in his seven-year-long political career Patnaik’s confidence did not seem to waver. The 58-year-old politician seems to be holding well on his own. Although the Assembly elections were due only next year, Patnaik pitched for simultaneous polls to the Lok Sabha and the Assembly apparently in the hope that the Vajpayee factor would offset any anti-incumbency wave. The official reason, of course, was that holding two elections in less than a year’s time would strain the already precarious financial position of the poor State. Patnaik has proved to be a trusted ally of the BJP at the Centre and has been successful to a great extent in running the coalition government since March 2000. But facing the challenge posed by the Congress(I) under the leadership of former Chief Minister J.B. Patnaik could turn out to be a different ball-game altogether. The writer-turned-politician, however, claims that he is confident about the BJD-BJP alliance emerging victorious. "J.B. Patnaik is old wine in old bottle. He has no relevance in the present century," he remarked soon after the former Chief Minister was appointed president of the Orissa Pradesh Congress Committee in January. 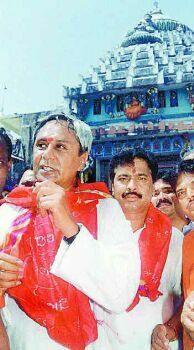 J.B. Patnaik was quick to hit back: "Naveen Patnaik should know that old wine will prove costlier for him." 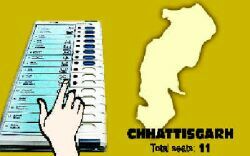 The electoral battle has hotted up in the 21 Lok Sabha constituencies and 147 Assembly seats. The Congress(I) has decided to field its candidates in almost all the Lok Sabha seats and contest from the majority of the Assembly segments, leaving some constituencies to the Jharkhand Mukti Morcha (JMM), the Orissa Gana Parishad and others. In 1999, the Congress(I) won only two (Koraput and Dhenkanal) of the 20 Lok Sabha seats it contested. 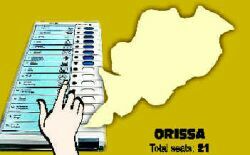 The BJD had contested 12 seats and won nine, while the BJP won seven of the nine it contested. The seat-sharing arrangement between the BJD and the BJP in respect of the Lok Sabha constituencies remains the same for the current elections. In the last Assembly elections, the Congress(I) performed poorly - it won only 26 seats. The BJD contested 84 seats and won 63, while the BJP won 38 of the 63 seats it contested. The number of seats the two parties will contest has remained unchanged this time, but they have agreed to exchange a few seats. The BJD’s campaign strategy so far has been to highlight the "clean image" of the Chief Minister and his "crusade" against corruption; the prevalent "feel good" factor; the developmental initiatives that have been taken by the government; and the Congress(I)’s "misrule" in the past. The BJP is readying itself for an aggressive campaign. Vajpayee’s leadership and his government’s achievements will be its main planks. Although hopeful of victory, senior leaders of the alliance are unsure of repeating the previous performance. Although there is no wave in favour of the Congress(I), they are leaving no stone unturned in their effort to secure a majority. The Chief Minister has already chalked out his plans to campaign in all the 147 Assembly constituencies. Trying to recover lost ground, the Congress(I) is highlighting the "failures" of the Patnaik government and the alleged irregularities in granting mining leases to private companies. The party has announced its plans to bring out a charge-sheet against the alliance government. The Opposition also plans to pin down the coalition over the lack of development in the State and its failure to secure a higher Central assistance and prevent the distress sale of foodgrains in western Orissa during the past four years. But the major accusation against the Chief Minister seems to be his overdependence on a retired bureaucrat. Both the Congress(I) and the BJD-BJP alliance claim to have taken into account the winning prospects while selecting their nominees. Yet, it appears that rebel candidates from all the three parties might enter the fray. The PCC chief is now playing the political game with the help of his experience of decades in politics. To supplement his efforts, a number of ousted BJD leaders, who include Rajya Sabha MP and former Union Minister Dilip Ray and former Ministers Nalinikanta Mohanty and Ramakrushna Patnaik, have joined the Congress(I). Ray, an influential politician, was a close aide of Biju Patnaik. He has already campaigned in the BJD chief’s constituency, Hinjili, promising to work in the Congress(I) to help realise Biju Patnaik’s dream of a prosperous Orissa. The Orissa Gana Parishad led by former Minister Bijay Mohapatra has entered into an alliance with the Congress(I). The OGP president was unable to contest the 2000 Assembly polls because the BJD chief denied him the party ticket at the last minute. Although the Congress(I) is gaining strength with the entry of several BJD rebels, the coalition appears to be on a strong wicket. The BJD is banking heavily on the reservoir of goodwill that Biju Patnaik enjoys and the untainted image of his Chief Minister son. THE ruling Communist Party of India (Marxist)-led Left Front (L.F.) in West Bengal is likely to strengthen its position in the State in the Lok Sabha elections on May 10. With a weak Congress(I) and the popularity of the Nationalist Trinamul Congress (NTC) and its chief and Union Minister Mamata Banerjee on the decline, the Left parties may very well look forward to a considerable increase in their current tally of 29 out of a total of 42 seats. In 1999, the CPI(M) won 21 seats and the Trinamul Congress eight. While the Congress(I) won three seats, the Bharatiya Janata Party got two. In the L.F., the Communist Party of India (CPI) and the Revolutionary Socialist Party (RSP) won three each and the All India Forward Bloc (AIFB) two. The CPI(M) will be contesting 32 seats, the RSP four, and the CPI and AIFB three each. The CPI(M) is fielding 12 new candidates in this election. The AIFB has two new faces in its list - Hiten Burman from Coochbehar and Subrata Basu from Barasat. The RSP and the CPI have renominated their sitting MPs. The NTC, the new avatar of the Trinamul Congress after it merged with former Lok Sabha Speaker P.A. Sangma’s faction of the Nationalist Congress Party (NCP), is contesting 28 seats. The Bharatiya Janata Party, an ally of the NTC, is contesting 12. A decision on the remaining two seats was yet to be taken at the time of writing. The Congress(I) is reported to have decided to contest 35 seats. Dum Dum, Jadavpur and all the seats in Kolkata - North West, South and North East - are important for the CPI(M) as in 1999 Jadavpur and the Kolkata seats were won by the Trinamul Congress and Dum Dum was won by the BJP. Union Minister Tapan Sikdar of the BJP will try to retain Dum Dum for the third time and will face Amitava Nandi of the CPI(M). The other sitting MP of the BJP, Satyabrata Mukherjee from Krishnanagar, will have to defend his seat against the famous athlete and CPI(M) candidate Jyotirmayee Sikdar. Left Front Chief Whip in the State Assembly Rabin Deb will face five-time winner Mamata Banerjee in the Kolkata South constituency. The Congress(I) is planning to field actress and social activist Nafisa Ali in the constituency. Kolkata North West, won in 1999 by Trinamul Congress candidate Sudip Bandopadhyay, will witness an interesting contest this time. In spite of having nursed his constituency well and being perceived to be a definite winner, Bandopadhyay, having fallen out with Mamata Banerjee, has been denied the party ticket this time. He will be contesting as an independent candidate and the NTC has fielded Kolkata Municipal Corporation Mayor Subrata Mukherjee. Indications are that a three-cornered contest will tilt the balance in favour of the CPI(M) candidate, Sudhangshu Sil, in this NTC stronghold. State Minister for Development and Youth Services Mohammed Salim has been renominated by the CPI(M) for Kolkata North East seat. In 1999, Salim lost to Trinamul Congress leader and former Union Minister Ajit Panja. The L.F. also hopes to recapture the Jadavpur constituency, once a CPI(M) bastion. 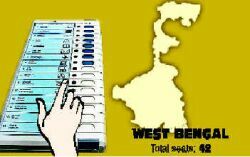 Trinamul Congress candidate Krishna Bose has won twice in a row from this constituency. This year she will face former MLA and CPI(M) candidate Sujan Chakraborti. The three sitting MPs of the Congress(I) - A.B.A. Ghani Khan Chowdhuri (Malda), Priya Ranjan Das Munshi (Raiganj) and Adhir Chowdhury (Berhampur) - will be contesting against Pranab Das and Minati Ghosh (both CPI-M), and Pramathesh Mukherjee (RSP).West Bengal Pradesh Congress Committee(I) president Pranab Mukherjee, who has never won a Lok Sabha election, is likely to contest against the CPI(M)’s Abul Hasnat Khan in Jangipur. The Congress(I) will support candidates of the Party for Democratic Socialism (PDS), formed by some activists expelled from the CPI(M), in the Bankura and Katwa seats. The industrial constituencies of Asansol, Durgapur, Howrah and Tamluk are also important for the L.F. The CPI(M)’s Swadesh Chakraborti who wrested back in 1999 the Howrah constituency lost to the Trinamul Congress in 1998, will defend the seat against the NTC’s Bikram Sarkar, sitting MP from Panskura. (Sarkar had won the Panskura seat in a byelection after Gita Mukherjee of the CPI, who had won it in 1999, passed away.) Former CPI MP and All India Trade Union Congress (AITUC) general secretary Gurudas Dasgupta will face Hema Choubey of the NTC in Panskura. Sitting CPI(M) MPs Sunil Khan and Bikash Choudhury will try to retain the Durgapur and Asansol constituencies. With Mamata Banerjee heading the Union Coal and Mining Ministry, the Asansol constituency, which is located in the coal belt of the State, becomes all the more important for the L.F. The crisis in the tea industry may have a strong impact on the outcome in the north Bengal constituencies of Alipurduar, Jalpaiguri and Darjeeling. In the last elections, riding high on the popularity of Mamata Banerjee, the Trinamul Congress made some inroads into rural Bengal, which traditionally was and still is the L.F.’s stronghold. (While the Trinamul won Barasat, Nabadwip and Contai, the BJP won Krishnanagar.) However, in a byelection that followed, Nabadwip was won back by the CPI(M). In the last polls, the Left Front won four less than what it did in 1998. CPI(M) Polit Bureau member and chairman of the L.F. Biman Bose had at that time acknowledged that the front was late in reaching out to the people about the dangers from communal forces. This time, however, the L.F. is not likely to make the same mistake. Pic 2: MOHAMMED YOUSUF ; Chief Minister N. Chandrababu Naidu receives Deputy Prime Minister L.K. Advani when his Bharat Uday Yatra reached Hyderabad. Pic 4: pic : M. LAKSHMAN/AP ; Tamil Nadu Chief Minister Jayalalithaa greets supporters as she arrives for a political rally in Chennai. Pic 6:C. RATHEESH KUMAR ; K. Karunakaran filing his nomination for the Rajya Sabha elections in Thiruvananthapuram on March 16. Also seen are Chief Minister A.K. Antony and Karunakaran’s son and State Electricity Minister K. Muraleedharan. Pic 8 : G.R.N. SOMASHEKAR ; Karnataka Chief Minister S.M. 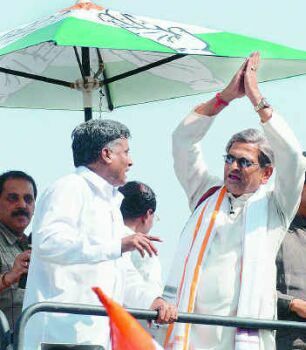 Krishna at an election rally in Bangalore on March 18. Pic 10: VIVEK BENDRE ; Former Deputy Chief Minister Gopinath Munde and Shiv Sena leader Uddhav Thackeray in Mumbai on March 17. 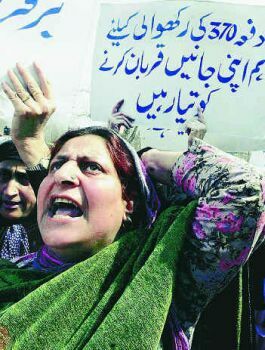 Pic 13 : SAJJAD HUSSAIN/AP ; "We will preserve Article 370 at all costs", reads a placard held aloft at a rally in Srinagar. 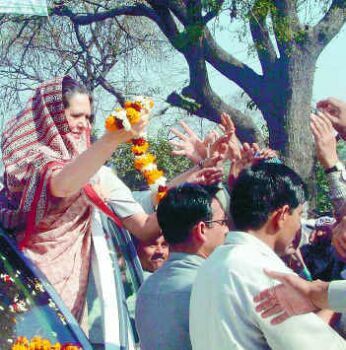 Pic 16: SANDEEP SAXENA ; Congress(I) president Sonia Gandhi during her Jan Sampark Yatra in Haryana. Pic 18: At the venue of a rally in Patiala, Punjab, where the Shiromani Akali Dal-Bharatiya Janata Party alliance launched its campaign on March 18. Pic 20 : Delhi Chief Minister Sheila Dixit coming out of the Election Commission office in New Delhi. 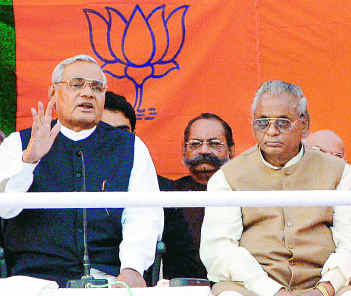 Pic 22: Prime Minister Atal Bihari Vajpayee addressing an election rally in Lucknow as former Uttar Pradesh Chief Minister Kalyan Singh looks on. Pic 23: A.M.FARUQUI ; Former Union Minister V.C. 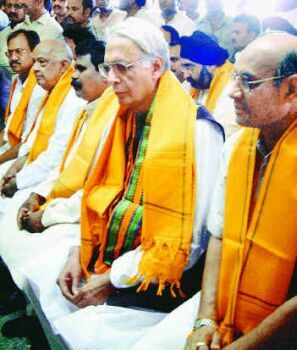 Shukla (second right) with BJP leaders at the party headquarters in Raipur on March 17. Pic 25: Bihar Chief Minister Rabri Devi with husband and RJD president Laloo Prasad Yadav and other party leaders at an election rally in Patna, at which Janata Dal(U) leader Mangani Lal Mandal joined the RJD. Pic 28: EASTERN PRESS AGENCY ; Biju Janata Dal leader Naveen Patnaik campaigning in Puri. Pic 29: DESHAKALYAN CHOWDHURY/AFP ; Chief Minister Buddhadeb Bhattacharjee addressing a Left Front rally in Kolkata on February 14.
in Frontline, volume 21 - Issue 07, March 27 - April 09, 2004.